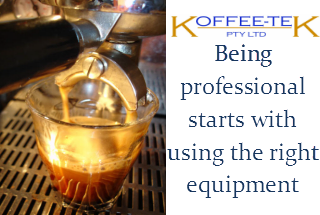 The specialists in Coffee Machine repairs in Brisbane! Our fully licensed electrical technicians offer advice and support on any brand of equipment. Our coffee roasting experience completes our ability to ensure beans, barista and machine are working in harmony to produce the perfect cup of espresso. We are the commercial one stop shop. We service, repair, clean, and perform scheduled maintenance on your commercial, home or office machines. We specialise in breakdown servicing and replacement of high use components in the group heads, steam taps and arms. We can test and make adjustments to all types of coffee machines and can provide electrical testing and tagging for your machine. 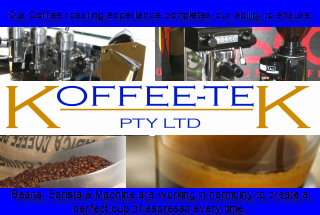 Koffeetek was established in 1995, since then we have become well known and highly respected in the espresso business. We understand that your business income relies on your coffee equipment working correctly and consistently, first time and every time. We can provide you with the ongoing support that you need to ensure your customers get the very best, premium quality coffee every time. We offer unbeatable onsite service and with the backup of our workshop, you can rely on us to keep your business pouring. 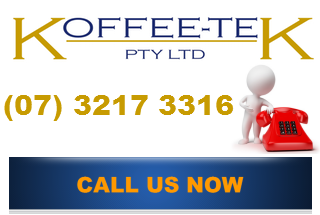 Koffeetek products are found in Cafe’s, Restaurants, Bars and Hotels throughout Australia. Our new and rebuilt machines are available for sale or lease. 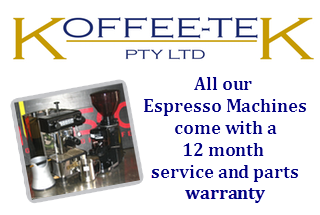 Koffeetek extends a full 12 month parts and service warranty on all machines. My Business is serving Brisbane, East Brisbane, Bowen Hills, Fortitude Valley, Herston, Highgate Hill, Kangaroo Point, Kelvin Grove, New Farm, Newstead, Paddington, Petrie Terrace, Red Hill, South Brisbane, Spring Hill, Teneriffe, West End, Woolloongabba, Albion, Alderley, Ascot, Aspley, Bald Hills, Banyo, Boondall, Bracken Ridge, Bridgeman Downs, Brighton, Brisbane Airport, Carseldine, Chermside, Chermside West, Clayfield, Deagon, Eagle Farm, Everton Park, Fitzgibbon, Gaythorne, Geebung, Gordon Park, Grange, Hamilton, Hendra, Kedron, Keperra, Lutwyche, McDowall, Mitchelton, Myrtletown, Newmarket, Northgate, Nudgee, Nudgee Beach, Nundah, Pinkenba, Sandgate, Shorncliffe, Stafford, Stafford Heights, Taigum, Virginia, Wavell Heights, Wilston, Windsor, Wooloowin, Zillmere, Acacia Ridge, Algester, Annerley Archerfield, Burbank, Calamvale, Carole Park, Coopers Plains, Darra, Doolandella, Drewvale, Durack, Dutton Park, Eight Mile Plains, Ellen Grove, Fairfield, Forest Lake, Greenslopes, Heathwood, Holland Park, Holland Park West, Inala, Karawatha, Kuraby, Larapinta, Macgregor, Mackenzie, Mansfield, Moorooka, Mount Gravatt, Mount Gravatt East, Nathan, Pallara, Parkinson, Richlands, Robertson, Rochedale, Rocklea, Runcorn, Salisbury, Seventeen Mile Rocks, Sinnamon Park, Stretton, Sumner, Sunnybank, Sunnybank Hills, Tarragindi, Tennyson, Upper Mount Gravatt, Wacol, Willawong, Wishart, Yeerongpilly, Yeronga, Balmoral, Belmont, Bulimba, Camp Hill, Cannon Hill, Carina, Carina Heights, Carindale, Chandler, Coorparoo, Gumdale, Hawthorne, Hemmant, Lota, Lytton, Manly, Manly West, Moreton Island, Morningside, Murarrie, Norman Park, Port of Brisbane, Ransome, Seven Hills, Tingalpa, Wakerley, Wynnum, Wynnum West, Anstead, Ashgrove, Auchenflower, Bardon, Bellbowrie, Brookfield, Chapel Hill, Chelmer, Chuwar, Corinda, Enoggera, Enoggera Reservoir, Ferny Grove, Fig Tree Pocket, Graceville, Indooroopilly, Jamboree Heights, Jindalee, Karana Downs, Kenmore, Kenmore Hills, Kholo, Lake Manchester, Middle Park, Milton, Moggill, Mount Coot-tha, Mount Crosby, Mount Ommaney, Oxley, Pinjarra Hills, Pullenvale, Riverhills, Sherwood, Sinnamon Park, St Lucia, Taringa, The Gap, Toowong, Upper Brookfield, Upper Kedron, Westlake.